Out of all my spring races, this is the one I was looking the most forward to, and not just because it was the last one (although that was also awesome…very burnt out on racing at the moment). I had been told by many runners that this race is awesome. It’s flat (as long as you are running the half and not the full) and you get to run through Churchill Downs the week before the Derby. I really wanted a PR at it, but I didn’t think I was in shape for one since February’s weather and whatnot messed up my sub-2:10 plan. Still, I made it my A goal. My B goal (the one I thought was actually obtainable) was to just be better than Oak Barrel, since that was my training race for this. C Goal: Just enjoy it! Jonathan and I headed up to Louisville on Friday afternoon. We checked into the Galt House, which was the official race hotel. There were several other conventions and things going on at the hotel, including a body-building competition and a junior chess championship. It made for an interesting mix of people wandering around the hotel, but with so many people staying there, it meant the elevators were sloooooow. After dumping our stuff in the room, we headed over to the expo. It was well-organized and went smoothly. We checked out several of the vendor booths, but I ultimately didn’t see anything I really wanted. We ate dinner at a local pub, wandered around the city for a bit, and then it was time to get some sleep. I had been obsessing over race morning weather all week. Rain and a possible thunderstorm were being forecast, with temperatures ranging anywhere from the 40s to the 70s. I had brought several outfits with me to have options depending on what it was actually doing that morning. When I woke up at 6am, I checked the weather. It looked like there would definitely be rain with temperatures in the low 50s. I opted for shorts and a long-sleeved top. I had prepped a garbage bag the night before to wear over my clothes until the start of the race. I headed out to the starting line. Corrals A, B, and C all seemed kind of sparse, but when I got to my corral, Corral D, people were everywhere! The gear check was also here, which may have been why. I squeezed in a spot near the front of the corral. I could see the marathon’s 4:30 pace group ahead of me in corral C. I knew I eventually wanted to try to catch up with them so I would be on course for a 2:15 half before the marathoners split from the half marathoners on mile 9. A couple girls next to me were discussing the race, so I asked if they had run it before. One of the girls, who turned out to be a local, had and assured me that it was flat except for the ramps in and out of Churchill Downs. The gun soon went off and all the corrals were released together. Note: I’m using my Runkeeper splits for this report, instead of my Garmin splits. We went through several tunnels on the course and Garmin reports that all wonky. I did not run an 8 minute mile on mile 13 of a half marathon. 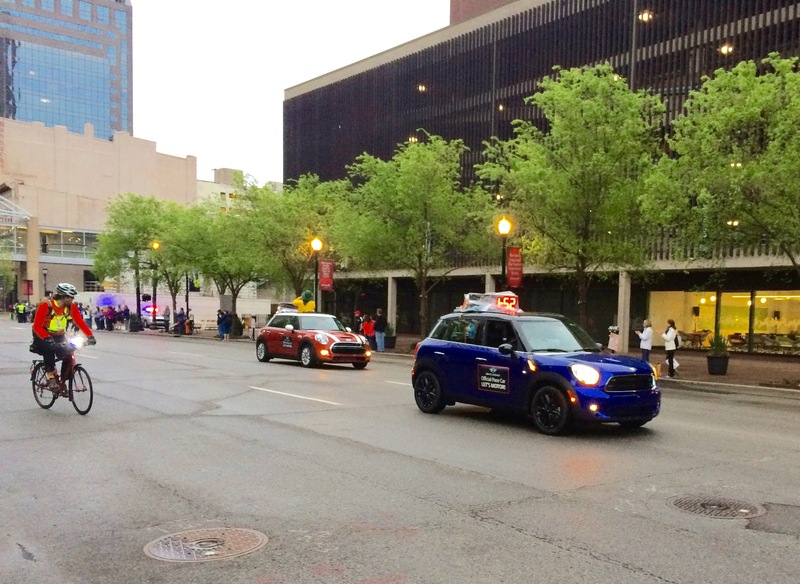 They had Mini Cooper pace cars! 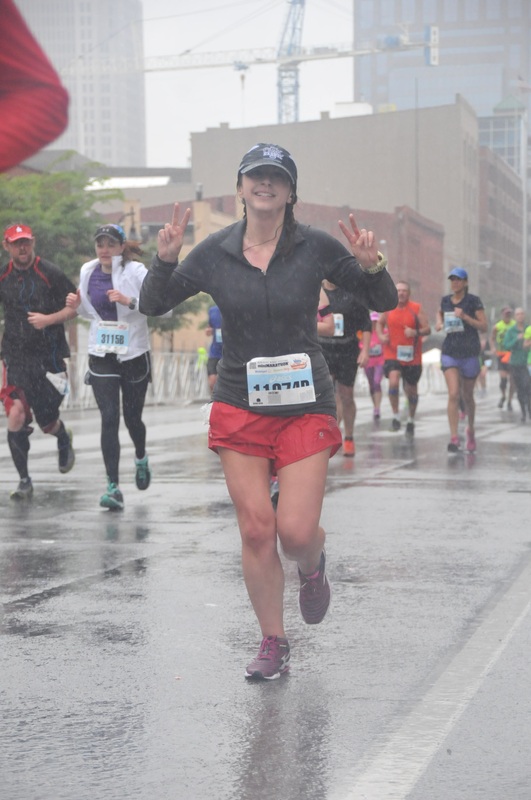 Although the rain held off while we were in the corrals, it started to sprinkle right as I crossed the start line. The first mile actually went by super quick. Soon after I started, I saw Jonathan in front of the hotel cheering me on. I ran over and gave him a high five and he assured me I was almost done. Ha! The first water stop was around mile 1.5, so I stopped briefly to gulp down some fluids. Time was still flying by at this point. I remember there were some spectators handing out orange slices, but I didn’t take one. I downed my first gel at the beginning of this mile in preparation for the second water station coming up. We passed a huge building that I assumed was a courthouse, but said it was a post office. Turns out it is a courthouse after all. About halfway through the fifth mile as we turned onto 4th Street, there was an awesome large group of spectators cheering. I gave a couple high fives and then I realized that my shoe had come untied, a race first! I pulled over to the side and quickly retied it. Halfway through this mile, my shoe came untied again! I was frustrated, so I double knotted it this time and hoped it wasn’t too tight. I finally came up to the 4:30 marathon pace group during this mile. I thought about staying with them for a bit, but I was feeling good, so I went ahead and passed them, since they would be splitting off in two miles anyway. This told me that I was doing pretty good on time, since they had been ahead of me at the start. We were running through a portion of the University of Louisville’s campus at this point, so there were lots of college kids out cheering us on. I ate my second gel right before the fourth water station at the start of the eighth mile. I knew when we reached the end of this mile, we would be right at Churchill Downs. I was so excited to get there. Running through Churchill Downs was awesome, even though it was probably the most congested part of the course. You go into a tunnel that runs underneath the horse track and come up on the inside of the field. There were horses running around on the outside, practicing and warming up for the next weekend’s race. They were so fast! It was completely exhilarating to be running so close to them. I wanted to stop to take a photo, but I knew I was doing well and didn’t want to use up any precious seconds of time. To exit, we went through another tunnel and up a ramp back to the street. I was so enthralled with Churchill Downs, I didn’t even notice this photographer. After we left Churchill Downs, I started actually paying attention to my time. I was estimating around 2:11 if I kept my pace at this point. I knew it would be tough but I thought I could do it. So I pushed on. We were running back through campus on this mile. I ate my last gel. I couldn’t believe there was only 5k left. I have never felt so strong at the end of a half. I wasn’t hurting at all. I continued giving spectators high fives as we ran back towards downtown. For the last couple miles, I put my Spotify playlist on. It pumped me up so much for the end of the race. 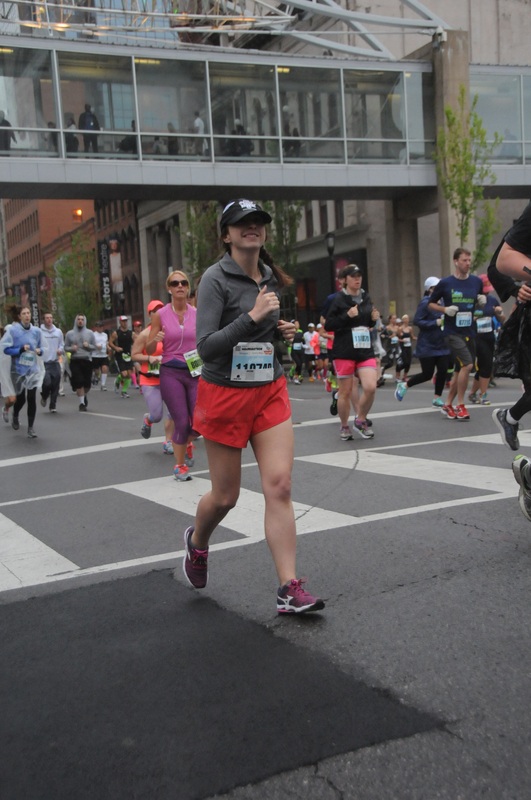 I was practically dancing my way to the finish line. The rain started to pick up. Jonathan was waiting for me back on Main Street as we neared the finish line. I knew I was definitely going to PR at this point, so I screamed “PR! PR!” at him as I ran by. 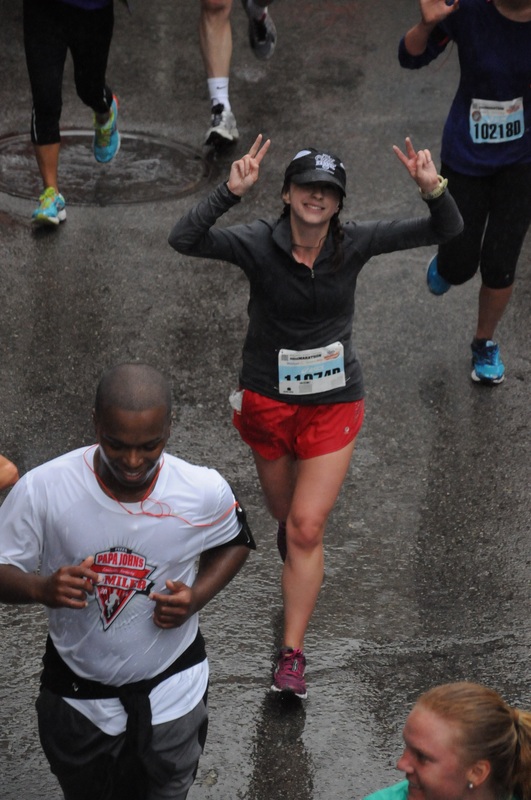 I’m pretty sure I had been grinning like an idiot the entire mile, even though rain was pouring down at this point. I posed for a picture before the finish line (now I’m stuck on victory fingers for some reason…I need some new poses) and then pushed with everything I had, around a 7:30 pace. I was so pumped. I knew I had done well, but I wasn’t sure how well. I pulled out my phone to see a text message with my time. I seriously have never felt so good after a half. I wasn’t hurting. I wasn’t exhausted. I had given this race everything I had and was rewarded with an awesome PR. As I came through the finisher’s chute, a medal was placed around my neck and I was given a mylar blanket (my first race space blanket!). The food line was kind of chaotic but I managed to grab a bagel and some chocolate milk (they also had bananas, chips, and crackers available, from what I could see through the crowd). I found Jonathan and then got to take a whack at the gong that was set up for you to hit if you got a PR! I loved nearly everything about this race. Even though all the corrals went out at once, the beginning never felt so congested that I couldn’t go the pace I wanted. Maybe that has more to do with people lining up in the appropriate corrals, I’m not sure, but I didn’t start too fast or too slow. The course was great. Lots of interesting things to look at and, of course, running through Churchill Downs was amazing, especially with the horses out practicing. And it was, in fact, fairly flat. A few inclines here and there, but nothing I would call a hill. There were ramps going in and out of Churchill Downs, but they were short. The volunteers and spectators were fantastic. Especially considering that it was raining the whole time! They all deserve medals for standing out in that. I was a little worried that the rain would keep the crowd support down, but it absolutely surpassed all my expectations. There were large crowds of spectators sprinkled all throughout the course, not just at the start and finish. I love that. There were plenty of water stations, and it seemed like most of them also had Powerade, if that’s important to you. (I accidentally grabbed a Powerade once instead of a water.) I can’t speak for any gels they had on the course, since I had brought my own, but a lot of spectators were also handing out orange slices. My only small quibble was the congestion around the food table at the end. I don’t know if that’s because they had to set it up in a smaller area under an overpass to keep it out of the rain or what, but I was unable to grab a banana. I did manage to get other stuff though, so it wasn’t a huge deal. 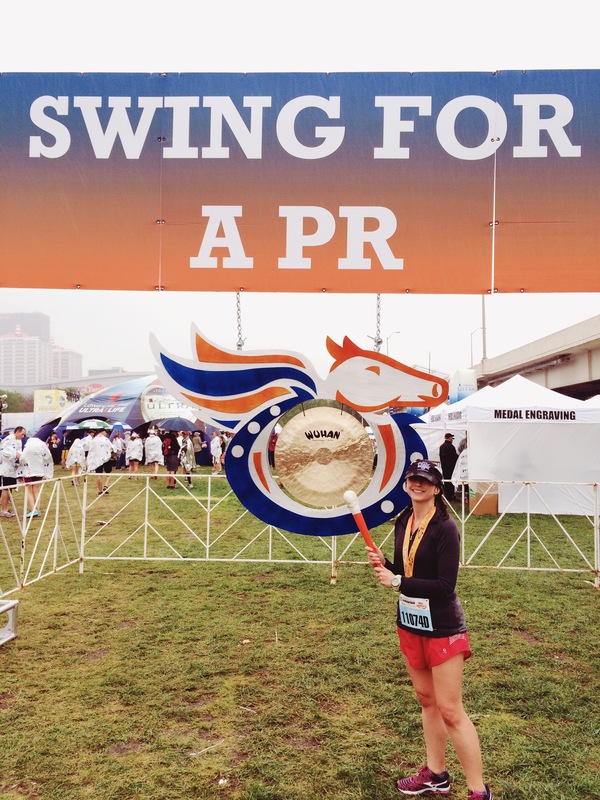 I loved the PR gong! The shirts are nice and the medal is definitely one of my favorites. They had engraving on-site for $10, but I was tired of standing out in the rain, so I will probably get it engraved with my time elsewhere. I wish every race felt like this! I never had a negative thought enter my mind. I never felt like I needed to walk. I knew this was my last race of the season, so I gave it my all and didn’t hold back anything. I negative split every 5k. That’s amazing. 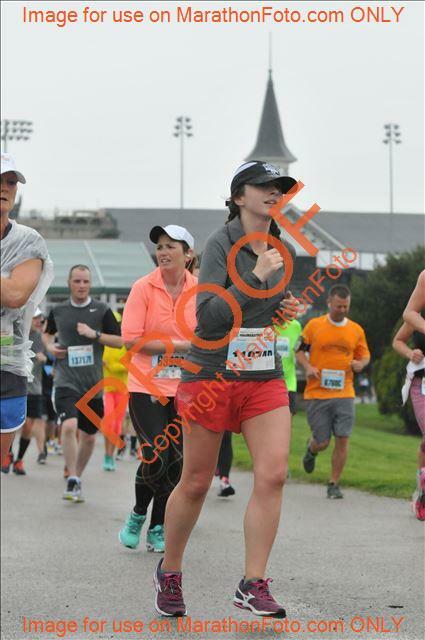 This entry was posted in Race and tagged half marathon, kentucky derby festival minimarathon. Bookmark the permalink.